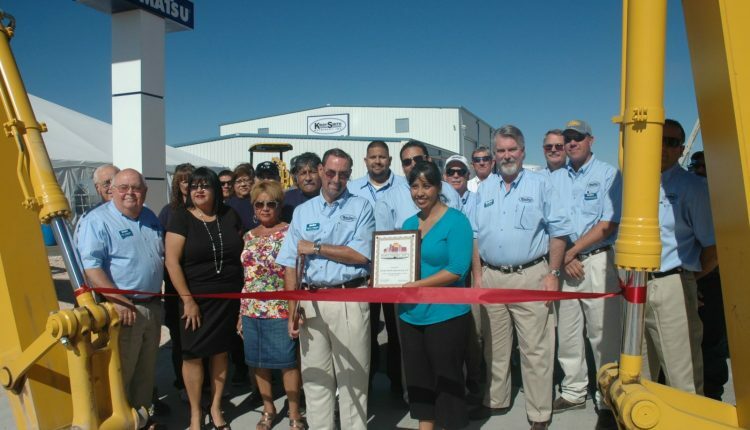 In mid-October, Kirby-Smith Machinery Inc. hosted a grand opening celebration for its newest branch location in Odessa, Texas. The Odessa Chamber of Commerce and Midland Hispanic Chamber of Commerce performed ribbon cutting events, welcoming Kirby-Smith Machinery to the Permian Basin area. Over 300 attendees participated in the grand opening. On display were more than $10 million in crane and heavy construction equipment. Kirby-Smith Machinery has been servicing the oil field construction and crane industry for more than 29 years and is recognized as one of the premier heavy construction equipment and crane dealers in the country. Kirby-Smith has service locations in Abilene, Amarillo, Dallas, Ft. Worth, Lubbock, Kansas City, Odessa, Oklahoma City, St. Louis, and Tulsa. Komatsu, Wirtgen Group, National Crane, Manitou, Gehl, DoppstadtUS, Atlas Copco, and Gradall are some of the products the company services.